First Lady Michelle Obama welcomed children of servicemembers at a special preview event of the White House's Christmas decor on Wednesday. This year's theme is "Shine, Give, Share," and decor involves shiny elements such as stars, quartz and metallics, as well as handmade decorations from guest artists. The theme also encourages individuals to shine, by helping out and "putting your best self forward," the White House said. Throughout the White House, members of the military and their families are honored in the decor. On the East Landing, the Gold Star Families Tree honors those who gave their lives in military service. The decor includes photos of those lost, and messages from their loved ones. "Each one showcases the strength and resilience that characterizes our Gold Star families," Mrs. Obama said. "They are heartfelt notes, like this one from a wife in East Peoria, Illinois. She wrote about her husband, saying, and this is -- these are her words -- 'He never thought of himself as a hero, but he always was to me'." During the holiday season, White House visitors will be welcomed to write notes to servicemembers. Visiting Gold Star families (those who have lost a family member) can inscribe a ceramic gold star to adorn the tree, which was decorated by Gold Star families who volunteered their time this holiday season. First lady Michelle Obama and her daughters Malia and Sasha received the White House Christmas tree Friday morning. "[W]e wanted to rally all Americans to honor, recognize and support our military families," Mrs. Obama said. "We wanted to make sure that never again would someone have to ask the question, 'What is a Gold Star family, and what does that sacrifice mean?' We all should know." The Blue Room -- home to the official White House Christmas tree, which arrived over the weekend -- features cards made by children of servicemembers. Medals, badges and patches adorn ornaments. 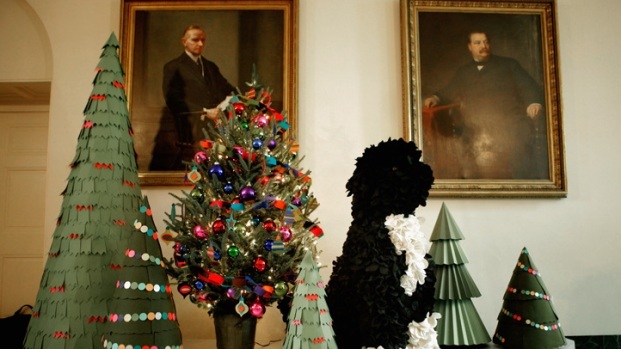 The East Garden Room is decked out in jewel tones, paper trees and felt garlands -- plus a topiary of first dog Bo Obama, who likes to spend time in the room. The Red Room has a tradition of featuring cranberries; this year, an arrangement of seasonal flowers, fruit and foliage is displayed in a handmade cranberry-covered vase. The library displays replicated holiday cards, letters and seasonal items dating back to the Eisenhower Administration. 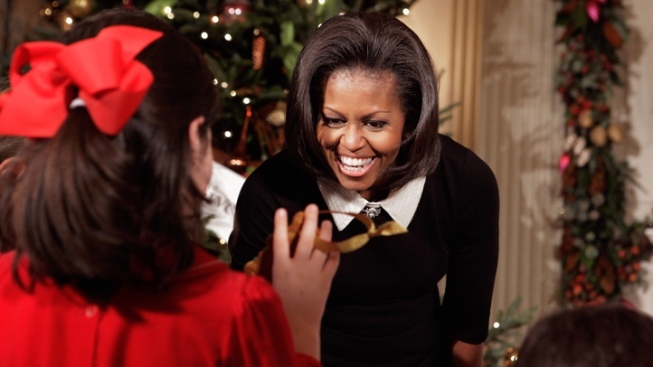 At Wednesday's event, Michelle Obama encouraged visiting kids to search for Bo. "You've got to find the Bo in every room, because he's hidden everywhere," she said. "So in one room, he's four-and-a-half feet tall and he's made of felt.... And in another room, he's nine-and-a-half inches tall, and he's made of buttons.... So, trust me, our dog has been a little confused walking around the house for the last couple of weeks, seeing himself in gigantic form." The White House expects about 85,000 visitors this holiday season.